More and more manufacturers agree that when it comes to marking packs with essential data (ie., barcodes, batch numbers & use by dates) the clear winner is Thermal Inkjet. The value proposition around convenience, cleanliness, clarity and cost is undeniable, especially when compared with outdated legacy technologies like continuous inkjet (CIJ) coding. Thermal Inkjet (TIJ) is a direct reference to Hewlett Packard (HP) technology. 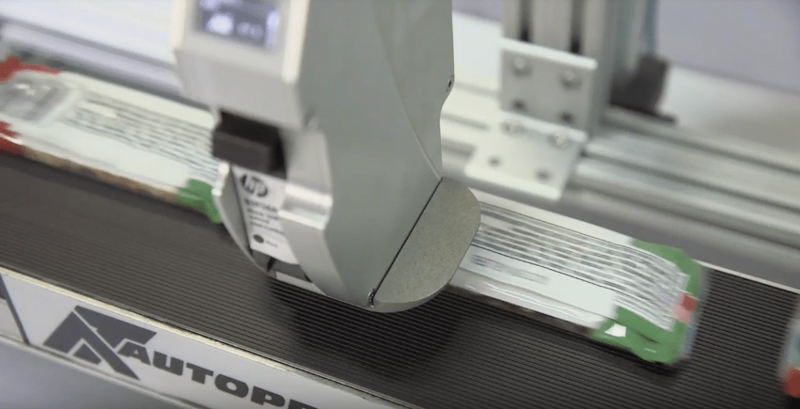 And when it comes to selecting the best TIJ coder, just look at who HP hired for coding of unit boxes and cases on its own cartridge lines: Markoprint by AT Information Products. Markoprint offers leading-edge solutions and solvent-based TIJ technology for printing on glossy, consumer-ready packaging. Industrial ink products are now available in several colors (black, red, blue, green, yellow, white), different formulations (pigmented, dye), and various durability ratings. There’s also a new line of UV visible and invisible options. The overall cost equation of TIJ supports a strong adoption rate of Markoprint in packaging coding. Take a closer look at the elements of cost when considering a Markoprint system for your operation. Starting with the capital outlay, the initial installed cost of Markoprint is roughly half compared to more complex CIJ systems. CIJ coding systems are bigger too. They need a separate control unit and pumps, which increases the overall CIJ footprint. In contrast, a TIJ system relies on a self-contained cartridge and typically takes up the same space as a paperback book, making it easy to squeeze into tight spaces around the production line. The ongoing cost of consumables are also in favor of Markoprint. A TIJ cartridge can print approximately 4 million individual characters (or 400,000 ten-character lines). A CIJ system uses a combination of ink and make-up fluid which can be costly. And when you factor in the new bulk-size supplies for TIJ, the calculation tips to Markoprint in terms of cost per character and much less waste. Markoprint coders use a simple and robust cartridge system that combines both a printhead and ink supply system. Replacing the print cartridge effectively replaces the entire ink delivery system, and this can be done within a few seconds, minimizing downtime and eliminating the need for repairs. In contrast, CIJ systems require regular servicing at around 6,000-hour intervals. Service visits add costs to the long term ownership of CIJ. Relative to CIJ, there are clear labor cost advantages when deploying a Markoprint coder. The TIJ systems are straightforward to install and operate. Highly skilled labor is not required. When turnover of labor occurs, the amount of training for the new operator can be accomplished in one shift. Conversely, the prevalence of hazardous fumes with CIJ takes its toll on the health and efficiency of laborers. Complex and unreliable technologies like CIJ require expensive service contracts too. This is great for the equipment provider, but an ongoing frustration for the customer. However, with Markoprint the simplicity of the system equates to little need for a maintenance agreement. Markoprint coders are also fabricated using industrial-strength aluminum housing. Their durability and reliability are a good fit for the toughest of packaging environments. When you factor-in all the components to cost, the compelling argument for Markoprint industrial inkjet coders is difficult to dispute. Markoprint wins for cost, quality and ease of use. See for yourself by contacting AT Information Products at (201) 529-0202 or leave a message here.